Federal student loan programs should be every college-bound student’s first stop when looking to supplement their college fund. Federal loans offer the lowest fixed interest rates, and the most attractive and flexible repayment plans. Government student loans are offered on the basis of financial need, and are not wholly dependent upon the applicant’s credit history. This makes them particularly suitable for college students who will have little or no credit history to speak of. Students in need of education loans are advised to investigate all possible Federal and State-based loans before pursuing any private student loans. Private student loans, also referred to as alternative student loans, are offered by banks and independent lending institutions to help cover any unmet financial need that remains after scholarships, grants, government loans and family college savings have been applied to a student’s tuition costs. They serve a vital function in helping students pay for their college education, but they should not be entered into lightly. Private student loans, unlike their Federal counterparts, are entirely decided on the basis of the applicant’s credit history. Most students will require a cosigner in order to qualify for a private loan, and will be expected to sign a binding promissory note guaranteeing repayment according to the terms and conditions of the loan. When considering a private lender student loan, the first step is to determine the total amount of your unmet need. It is important to calculate as nearly as possible the amount of money needed to cover any outstanding college costs. Rule number one concerning private, or alternative, student loans is to never borrow more than is absolutely necessary. When calculating the total cost of college attendance, remember that you must consider not only tuition fees, but all additional costs such as books, housing, lab fees and any other education-related expenses. From this total, students will need to subtract the total amount of their college fund, including personal savings, scholarships, grants and any federal and state loans for which they have qualified. What remains is your unmet need, and this is the amount you will use when considering any private loans. The precise calculation of your unmet need will help you avoid taking on more in student loans than is absolutely necessary, so it is important to give this step due time and attention. Most banks and private lenders offer their own college cost calculators, and these can be accessed on the lender’s website. Tuition calculators and student loan calculators are helpful tools to assist students, and their families, in determining the remaining funds necessary to cover the actual costs of college attendance. When college-bound students have exhausted all other forms of financial aid, it may be necessary to consider a private student loan. Most national banks and private lending institutions offer their own types of education loans. Each lender sets their own terms and conditions, and no two private student loans will be exactly alike. Different lending institutions will offer different interest rates, loan limits, processing fees and repayment requirements. Students should understand all aspects of the loan being considered before signing any agreement. Banks and private lending institutions make applying for student loans easy, and many offer online application processes. However, students should not be swayed by convenience and accessibility. 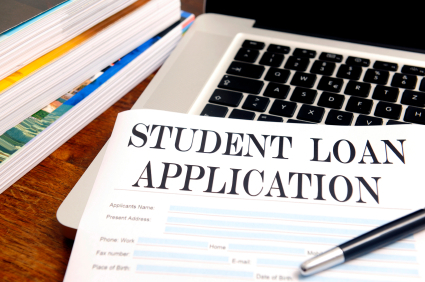 Private student loans require careful consideration, and many college students have been undone by taking on more than they can handle in private lender loans. Unlike Federal student loans, which are largely determined by financial need, private student loans are entirely based on the applicant’s credit history. The terms and conditions of private lender loans will vary according to lender, and according to the applicant’s credit score. College-bound students considering a private lender should make a note of the following points when negotiating any loan agreement. Private loans are subject to higher variable interest rates than their Federal counterparts. Private student loans rarely offer grace periods for repayment. Students, or their parents, are required to begin repayment immediately after the funds have been disbursed. Private lender loans often contain origination and processing fees, as well as penalties for early repayment. Borrowing limits for private loans are determined by credit history, and lenders typically set a minimum loan allowance. Before signing any loan agreement, students should be certain that they understand all of the terms and conditions associated with their private student loan. This includes repayment plans, interest levels and all fees and penalties associate with the loan. Finding the money for college can be a stressful time, and students may feel rushed to complete their loan applications and secure their funds as quickly as possible, but it is important to take the time to compare various lenders and loan services before signing any contract. Ask detailed questions about any part of the loan agreement that seems unclear, and only sign when you are certain you understand, and are prepared to meet, all of the loan’s requirements. When used judiciously, private/alternative student loans can help bridge the gap between a student’s accumulated college fund and any remaining unmet need. They remain a vital tool for students looking for the necessary money to pay for college, but private loans do contain hazards for the unwary. Never consider a private student loan lightly. Be sure you understand what is being offered by the lender, and what will be required of you – the borrower. Never sign a loan agreement until it has been explained to your satisfaction, and always remember rule number one: Do Not Borrow More than You Absolutely Need.